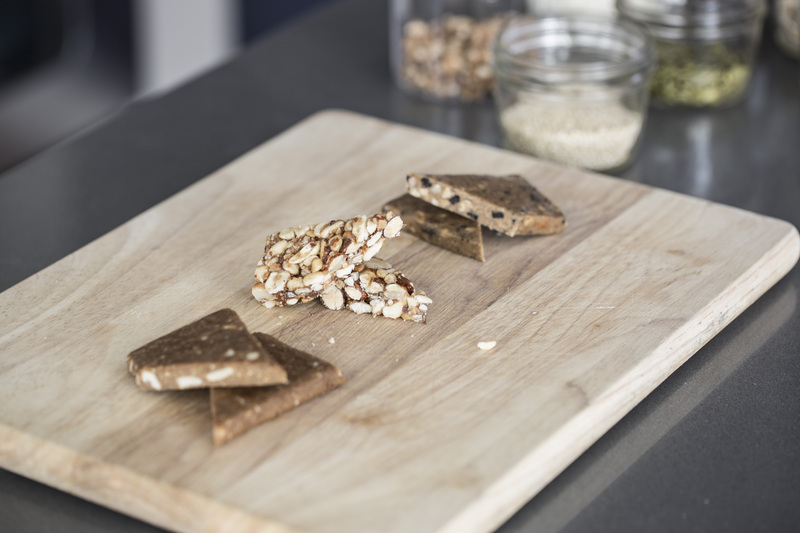 There’s no better snack than whole foods such as nuts, seeds, and fruit, but a nutritious snack bar can save your life on a crazy busy afternoon. We’ve all had that day, when lunch is delayed, a phone call ran over or you’re stuck in traffic, darn it! You’ve forgotten to pack a snack and you need to get some calories in quick before you turn into a hungry monster. So you run into the nearest deli and want to grab a healthy snack bar. There are so many bright packages, all professing something – “protein packed,” “all natural,” “gluten free,” “vegan.” What the heck do you choose? Which will conquer your hunger for more than 5min and still be healthy for you? The below information will give you tools to use when choosing a bar. Get the hang of using these tools so it becomes easy to make a choice that will keep you healthfully powered and satiated till your next meal. Overall Ingredients: It should be simple, no more than around 12 ingredients and if you can’t pronounce it, or don’t know what it is, don’t eat it. Watch out for caramel coloring, this is commonly added to “health food” bars. If “natural flavor” appears in the list, there is nothing natural or real about it. Keep it real! Fiber: Your body doesn’t actually digest or absorb fiber. It makes you feel full by slowing down the food traveling through your stomach and intestines. It keeps you satiated! It also helps move the unwanted out of your body, if you know what I mean. Look for bars that contain at least 3grams of fiber. Protein: It builds your organs, muscles, hair, skin, nails, bones and helps transport electrolytes. It creates the tangible you! Get at least 5 grams. If you’re looking for a post-workout protein bar get something with at least 12 grams or more. Sugar: Most bars are sugar-laden traps that will spike your blood sugar making you feel good for a moment and then crash you out soon after eating. This is especially strenuous on your pancreas and liver. No more than 30% of the total calories should come from sugar. We get a little mathematical here, but once you get the idea you won’t need the calculator. Bear with it and take away the generalization. There are 4 calories/gram of sugar, so multiply the grams of sugar x 4, put that number over the total calories then multiply by 100, that’s your percentage of calories from sugar. Hang in there! Here’s an example: If you have a bar with 200 total calories and 10grams of sugar, 10(4) = 40calories, (40/200)*100=20% of your calories come from sugar. From here you can make generalizations, now you know if your bar has around 200 calories there should be no more than 10grams of sugar, 400 calories should be no more than 20grams of sugar, 100 calories no more than 5 grams of sugar and so on. Ingredients: If you can’t pronounce it don’t eat it. NO coloring, keep it real! Macro Bars – Protein Pleasure. Macro Bars are an excellent product with outstanding ingredients, explore the different options and find what’s right for you. Lara Bar – Uber, Roasted Nut Roll. Zing Bar – Almond Blueberry.